Choose the Desired Action and Click&Clean Does the Work for You! 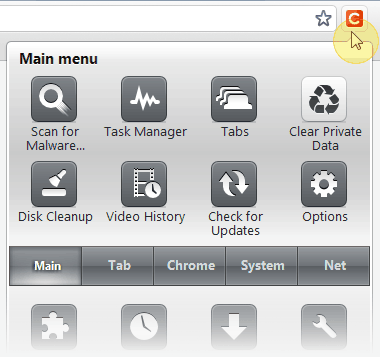 Starting from Click&Clean version 7.8, you can choose an action to perform when you click on the Click&Clean icon placed at the right of Google Chrome's address bar. Currently, there are two basic actions you can choose from. 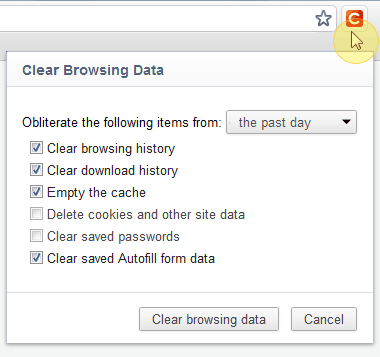 The first option, which is enabled by default for all new users, is Clear Browsing Data. This means that when you click on Click&Clean button, a Clear Browsing Data dialog (Pic.1) will open so you can remove your private browsing data (typed URLs, your browsing and download history, cache, cookies, stored passwords, saved form data, Flash LSO, Silverlight cookies, and Java cache) instantly, with just a click. 2. Click on the left menu "Advanced", and then select the checkbox "Enable extra features"
If you have any suggestions on how we can make your experience with Click&Clean even more worthwhile, please feel free to contact us by filing out our suggestion box on the Feedback page.